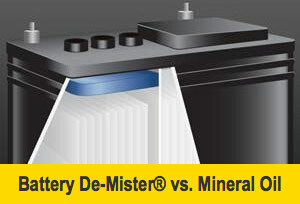 The sole objective of test 091794, was to determine if a standard lead acid battery with ThermOil® Battery De-Mister® additive would evolve less water loss in an environment similar to that found in the Solar Voltaic applications, where the batteries are subjected to daylight charging through solar photo voltaic panels, than would identical batteries, without ThermOil® Battery De-Mister®. The Batteries Under Test, were four identical Golf Car Batteries, of 220 Ampere Hour rating. Two of the batteries were treated with normal dosage of Thermoil. 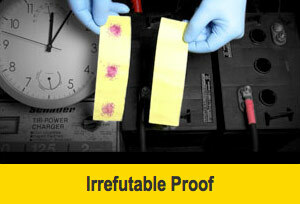 The other two batteries did not have Thermoil® Battery De-Mister®. The four batteries were assembled in a Series configuration to obtain a twelve cell, twenty-four volt battery pack. Each of the four batteries was assigned a serial number: The non-oil batteries were assigned the numbers 1.1 and 1.2. The oil batteries were assigned the numbers 2.1 and 2.2. The arrangement (starting at the assigned positive terminal) was 1.2 –2.1 – 1.2 – 2.2. 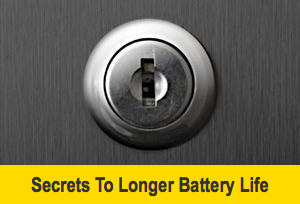 This meant that the oil batteries were staggered as the second and fourth batteries in series. Four (4) 51 watt solar panels were configured in series/parallel to obtain a maximum potential of six amperes of charge rate from the panels, the output from the array was sent through a “charge controller” (voltage regulator) that could achieve an accuracy of .1 VDC charge regulation. The charge controller was set to limit the charging voltage to 29.0 VDC. This is equivalent to 2.417 VDC per cell in the battery bank. The batteries were weighed and recorded before the test began. The results of which are on file as reference 091794-A. The scale used is a precision digital scale, 0-150 lbs with .05 lbs resolution. A standard calibration weight of 50.00 was used throughout the test to confirm the stability of the scale definition. The solar controller was enabled. This allowed the array to deliver 29.00 VDC to the battery bank. The array was subjected to day/night operation, cloudy and partly cloudy days. No load or discharge was put to the battery bank. The batteries were not cycled. At no time did the charging rate exceed 29.00 VDC. A total of 2.93 KWH was transacted over a thirty (30) day period. The array was then disconnected from the battery bank. The batteries were then weighed. The results were recorded in a table in reference 091794-A. The non-oil batteries had a considerable amount of electrolyte “carryover” on the top of the battery case. Batteries 1.1 and 1.2 were about equal in the amount of acid on the battery lid. The oil batteries had no acid or wetness on their tops. Batteries 2.1 and 2.2 had dry lids on them (see photo). All electrical values were corroborated with the use of an Analogic DP-100 software drive 5 1/2 digit DMM. The reference weight is a 50.00 lb class K, N.I.S.T. approved measure. The test is remarkable in its simplicity. 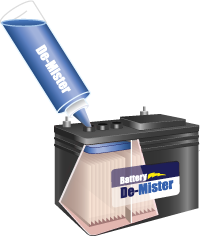 Four identical batteries were configured in a series; two with Thermoil® Battery De-Mister® and the remaining two without Thermoil® Battery De-Mister®. The environment that they were subjected to can be considered as “normal outdoor”. The test was conducted at a location in the Mojave Desert of California. The test started 17 September and terminated 17 October 1994. The batteries were out of doors, not in direct sunlight. Daytime ambient temperatures, averaged 74ºF and night temperatures averaged 50ºF. The application of voltage regulated solar voltaic panels in a duplication of the environment of many thousands of similar lead acid batteries used in alternate energy format. The weight loss “differential” is a direct, irrefutable, result of having an oil layer interfere with the natural electrolysis of H2SO4 into hydrogen and oxygen gas, which escapes through the vent caps of the cells. Loss of electrolyte level through evaporation is also suppressed by having the oil interfere with this process. The Thermoil® Battery De-Mister® batteries did not lose weight, while the non-oil batteries did lose weight (see 3D Chart 091794-A). The non-oil batteries were wet with carryover acid that migrated out of the cells and onto the top of the batteries. This carryover was noticeable, and was documented in a set of 35 mm photographs that was furnished to Thermoil Corporation. The Thermoil® Battery De-Mister® batteries had dry tops, which had an absence of any contamination, other than environmental dust. The primary parameter of this test had all four batteries exposed to EXACTLY SIMILAR electric and environmental conditions. It is a fundamental law of electricity that the amperage shall be the same in any part of a series circuit. This makes it impossible to have different batteries subjected to different values during this test. It is important to understand that this test does not imply anything other than which is explicitly stated in the text of this test. No other representations may be construe from the findings, other than the findings that the batteries differed in the amount of weight loss by the non-oil batteries.